will this pulleys make noise any noise? Community Q&A Question: will this pulleys make noise any noise? I have stock pulleys and I know if I just by pass the ac with a short belt the car will performed good with no noisy belt. Now Will This Pulleys From Sve, Will MY Belt Slip And Make Noise Until THE engine Warms up? This I see this in other reviews. 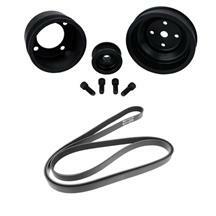 As long as your belt tensioner is in proper working order, you should not experience any belt squeal with this kit. If the tensioner is weak it will allow the belt to slip and that is what causes the squealing noise.